The eighteenth-century physician and collector William Hunter was unique among his contemporaries in several ways, not least in having had the foresight to bequeath his entire museum collections and library to his alma mater, thereby avoiding their dispersal in the salerooms. Hunter was born in 1718, the seventh of ten children, into a landowning family of modest means. He went to Glasgow University with a view to entering the church. However, exposure to the incipient rationalism and thinly disguised Arminianism of Francis Hutcheson, the recently appointed Professor of Moral Philosophy, turned his mind from that course, and widened his horizons. After five years of study Hunter left the university without graduating. Following an unsuccessful attempt to become the local schoolmaster, he was offered the opportunity of studying medicine by William Cullen, a friend of the family with a medical practice in nearby Hamilton. With the intention of entering into partnership with Cullen, Hunter attended lectures on anatomy at Edinburgh and then, to broaden his experience and knowledge of both surgery and midwifery, he departed for London in 1740 to join a growing body of medical Scotsmen there. Lodging first with William Smellie, one of the first man-midwives, he soon left this couthy home-from-home to join the household of the distinguished and more urbane Dr James Douglas. Douglas opened Hunter’s eyes to what successful medical practice in the metropolis could offer, and from that point on he never seriously considered returning to Scotland. James Douglas, as a Fellow of the Royal Society and the Royal College of Physicians, and as Physician Extraordinary to Queen Caroline, had entrée into court circles. He was a scholar, bibliographer and collector, having amassed a staggering 557 editions of Horace. 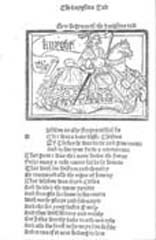 Left:The opening of the Knight’s Tale from Richard Pynson’s edition of Chaucer’s Canterbury Tales, London 1491 – 92. 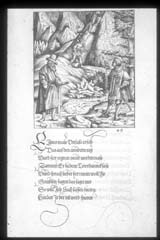 Right:Melchior Pfintzing’s Die… Geschichten des… Ritters Herr Tewrdannckhs, Nuremberg, 1517. Hunter’s copy of this allegorical poem of chivalry, printed on vellum, contains 118 woodcuts. In 1767 Hunter opened his own lecture theatre at his house in Great Windmill Street. The building, currently the stage door to the Lyric Theatre, became the repository for his varied collections. In his first lecture there he told his assembled students that money was ‘of no use to him except for acquiring and communicating science’, and this he did in every conceivable discipline. At the heart of his collection were the anatomical preparations which were essential to his teaching. At a time when cadavers for dissection were hard to obtain, such preparations were valuable in demonstrating points, especially in the case of pathological condition. In other areas of collecting, Hunter’s connoisseurship was apparent. Not surprisingly for the first lecturer in anatomy at the newly formed Royal Academy of Art, he was both interested in and had a keen eye for painting. As well as works by British contemporaries, such as Sir Joshua Reynolds and George Stubbs, he acquired three paintings by Jean-Baptiste-Simeon Chardin. And while several of his Old Masters have questionable attributions, an oil study entitled ‘The Entombment of Christ’ can be ascribed with confidence to Rembrandt. In the field of numismatics he assembled a peerless collection, especially strong on Greek coins; and in the area of natural history, the purchase of John Fothergill’s shells gave him a conchological collection second only to that of the Duchess of Portland. After Hunter’s death in 1783 the collections were held in trust for several years in London, where they were at the disposal of Matthew Baillie, Hunter’s nephew. When in 1807 the collections of coins, paintings, minerals, shells, anatomical and natural history specimens, printed books and manuscripts were received by the University of Glasgow, the university was given an incalculable boost, from which it is still benefiting. Hunter’s library alone, comprising some 10,000 printed volumes, at a stroke augmented the university’s stock by fifty per cent, bringing distinction and character to an adequate, but undistinguished, academic collection. Moreover, the 650 manuscript codices in the collection, over 100 of them illuminated, accorded Glasgow a prominence which it could not have achieved with its own resources. At first Hunter’s collections were housed within the university grounds behind the High Street, in a classical-style building designed for the purpose by Glasgow architect William Stark. This was to be the first public museum in Scotland and only the second, after the Ashmolean, in Britain. By eighteenth-century standards Hunter’s was a large library, though by no means the biggest. He was neither as wealthy nor as omnivorous as, for example, Robert and Edward Harley, Earls of Oxford, who amassed a library of around 100,000 items. But he was ahead of Edward Gibbon, whose library numbered some 6000 volumes. Hunter’s medical books account for perhaps a third of his library. There is a good balance between the great historical texts and the writings of his own contemporaries. Anatomy and obstetrics – the two fields in which Hunter made his fame – are particularly well represented, though other specialities emerge strongly, such as military and naval medicine and the deficiency diseases. The remaining two-thirds of Hunter’s library reveal enthusiasms both wide and deep. He followed the gentlemanly fashion of his time for fine typography – acquiring over 500 books printed in the fifteenth century. He did not capture a copy of Gutenberg’s forty-two-line Bible, but he did have the two Ciceros of 1465 and 1466 from the press of Fust and Schoeffer, Gutenberg’s immediate successors in Mainz. To these he added examples representing all the important presses of fifteenth-century Europe, including ten books printed by Caxton at Westminster. A more than passing interest in the inception and progress of printing with Greek fonts is evidenced by a fine group of Greek incunabula and his own extensive bibliographical notes. Out of some thirty or so items printed in Greek before 1501, Hunter possessed a remarkable twenty-one. 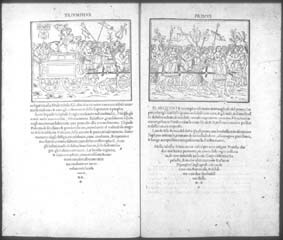 Right:From the press of Aldus Manutius, perhaps the most famous of all early illustrated books, the Hypnerotomachia Poliphili. Amongst the sixty-three works from the press of Aldus Manutius in the collection, is a first edition of what is probably the most famous of all early illustrated books, the Hypnerotomachia Poliphili, that curious phantasmagoria of ancient architecture, pagan ritual and triumphal processions. Its masterly integration of type and wood-cuts, forming wonderfully arresting designs on almost every page, makes it one of the first truly typographic books. Another tour-de-force of early letterpress and relief illustration owned by Hunter, this time from the beginning of the sixteenth century is Melchior Pfintzing’s Die… Geschichten des… Ritters Herr Tewrdannckhs published at Nuremberg in 1517. Hunter’s lavish copy of this allegorical poem of chivalry is printed on vellum. In all there are 118 woodcuts by Hans Schäufelein, Leonhard Beck of Augsburg, Hans Burgkmair, and others. The unusually elaborate type design, based on the hand of the emperor’s secretary, Vincens Rockner, took five years to prepare. This is only one of some 2300 books printed in the sixteenth century – further evidence of Hunter’s passion for early printing:in the main he concentrated on the classical texts – with no less than forty-four editions of Aristotle and seventy of Cicero printed before 1599. Hunter’s holdings of vernacular literature are characterised by their quality rather than by their completeness:many of the great names are represented, often in rare and important editions – Chaucer, Shakespeare, Spenser, Cervantes, Dante, Boccaccio, Rabelais. But writers nearer to Hunter’s own time, such as Dryden and Fielding, are all but ignored. As for the sciences:the writings of the great sixteenth and seventeenth-century physicists, Copernicus, Kepler, Tycho Brahe, Newton and Hooke are all in his library. Hunter owned a first edition of the De Revolutionibus of 1543, bearing the annotations, not only of the seventeenth century Dutch astronomer, Willebrord Snell, but also those of the famous cartographer Gerhard Mercator. His library also contains a wealth of zoological and botanical works, including Edward Tyson’s Orang Outang of 1699, a seminal work on comparative zoology, Maria Merian’s book on the insects of Surinam, and the Hortus Cliffortianus of Amsterdam, 1737, Linnaeus’s illustrated account of plants in the garden of the Anglo-Dutch banker George Clifford. Of the literature of exploration and travel, Hunter was especially sedulous in collecting early Americana – pamphlets on the cultivation of silk works in Virginia, accounts of expeditions to find a Northwest Passage to the Pacific, early Harvard College theses. Accounts of contemporary explorers, such as Cook’s voyages to the South Seas, were also sought. A strong section on numismatics and of books on the fine arts were probably acquired in support of Hunter’s other collecting activities. Architectural books are by no means insignificant, the most spectacular being Piranesi’s etchings of ancient Rome, the Veduti di Roma of 1765. Hunter also possessed the publications of several leading architects of his day:Sir William Chambers, who introduced Chinese influence into the design of gardens, and James Stuart, whose Antiquities of Athens brought Greek classical designs into London buildings. In common with many other eighteenth-century collectors, Hunter was not overly concerned with what we should now call ‘original condition’ – unless it was a Grolier binding, of which he had four examples. Many old bindings (and their fly leaves, so often covered with notes of early ownership) were discarded and the books rebound. Left:An initial letter from a manuscript of Livy’s History, showing Hannibal crossing the Alps and the defeat of the Romans on the banks of the Ticinus. 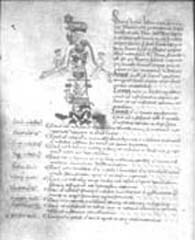 Right:Hunter’s copy of Speculum Phlebotomiae, dating from the second quarter of the fifteenth-century, includes an image of a Zodiac man, intended to inform surgeons as to how astrological signs influence parts of the body. How did Hunter acquire his library? Around 150 books came as presentation copies. Medical books head the list of gifts and show the esteem in which Hunter was held by colleagues – men like Thomas Dimsdale, who gave him a copy of his Tracts on Inoculation. In 1772, Sir William Hamilton, British envoy in Naples, gave Hunter a volume of twenty anatomical drawings by the seventeenth-century artist, Pietro da Cortona, saying that they ‘could no where be placed to such advantage as in your museum.’ In 1775 Michele Troja, sent Hunter a copy of his pioneer work on the generation of bone tissue. And there are scores of printed medical dissertations from newly qualified doctors. A wide range of non-medical gifts confirms a host of friendships with literary figures and artists. We know, for instance, that Hunter and Samuel Johnson were well acquainted. At the end of 1774 Johnson asked Hunter to present to the King a copy of his recently published Journey to the Western Isles, as well as giving one to Hunter himself. Adam Smith presented a copy of the second edition of his Wealth of Nations and Horace Walpole, who gave a copy of his Strawberry Hill edition of Hénault’s Cornélie. In 1768 Hunter informed William Cullen, ‘I am pretty much acquainted with most of our best artists here and live in friendship with them.’ It is not surprising, then, that Sir Joshua Reynolds gave him his Discourses to the Students of the Royal Academy, or that Allan Ramsay sent him copies of his literary writings. Hunter was a pre-publication subscriber to some twenty works, including several on architecture and decorative art:for example, Robert Adam’s Ruins of the Palace of the Emperor Diocletian and George Richardson’s Book of Ceilings. And his admiration of Baskerville no doubt accounts for Hunter’s name amongst the subscribers to the Paradise Lost of 1758 and the Orlando Furioso of 1773. The bulk of Hunter’s contemporary books were probably purchased directly from booksellers. For most scholars the predominant interest of Hunter’s library lies in the older materials – around 8000 volumes in all. The simple answer as to how Hunter acquired them is that they were mostly dead men’s books, which sooner or later appeared in the auction room. In the eighteenth century the practice of bequeathing one’s books to an institution was not so common (Sir Hans Sloane, and Hunter himself, are notable exceptions). In the main, libraries went back into the market place; by 1777 auctioneering had become so profitable that an excise tax was introduced on auction sales to help pay for the American war. Evidence from provenance notes and surviving annotated sale catalogues indicates that between 1754 and 1783 Hunter bought at over fifty book auctions. The first sale at which he was a significant buyer took place at the end of 1754 and the beginning of 1755, when the library and museum of Richard Mead came on the market. In August 1754 Hunter wrote to William Cullen, anticipating a heavy outlay:’I am afraid I shall ruin myself in the winter with it.’ In the event, as well as consolidating his holdings of early medical books, he bought an Egyptian mummy for thirteen guineas. Ten years later, by which time Hunter had become a leading figure in the London sale rooms, he was a prominent bidder at the sale in February 1764 of James Dormer’s library:he spent £120 17s on 123 books. Dormer was a military, not a medical man and his library was largely a literary one. It was here that Hunter got for 4s. 6d. a copy of Lily’s Grammar which had earlier belonged to Ben Jonson. In 1765 at the sale of the library of Joseph Letherland, another physician-collector, Hunter also bought heavily:138 lots (mainly medical or scientific works), for £139. The Whitehall Evening Post for 15 August 1769 announced that an auction sale had recently taken place in Paris of a library ‘supposed to be one of the best chosen in Europe,’ going on to say, ‘among the purchasers we hear Dr Hunter laid out a thousand guineas’. The library was that of Louis Jean Gaignat, an official at the Palace of Justice in Paris. Most of the books Dessain acquired for Hunter were either illuminated manuscripts (of which he got eleven) or incunabula (of which he acquired 160) – almost a third of Hunter’s final holdings of fifteenth-century books. Another physician-collector’s library came up for sale in 1775:the library of Anthony Askew. It was at this sale that Hunter made his most indelible mark ever:for £483 he got 284 books, the largest number at any sale he attended. Askew’s library, described as the ‘rarest collection of Greek and Latin books ever sold in England’, was much to Hunter’s taste. 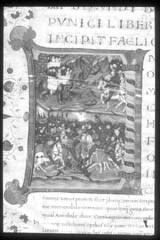 He came away with twenty-nine incunabula, including two fifteenth-century block books, an Apocalypse and a Biblia Pauperum, for which he paid £21 and £16 respectively. In general collectors of the eighteenth century placed a higher premium on the products of early printing, and in particular incunabula, than manuscripts, as may be seen from the relative prices realised at auction. However, Hunter, in addition to acquiring an extensive collection of incunabula, also purchased some 240 manuscript codices which can be assigned to the fifteenth century or earlier, over one hundred of which are illuminated. As with the printed books, the majority of Hunter’s manuscripts were acquired in the sale-room. Many of his important manuscript purchases (including the Hunterian Psalter) were made on the continent at three notable sales:in 1769, at that of the renowned bibliophile and art collector Louis Jean Gaignat, already referred to; in 1776, at the sale of the library of César de Missy, a Berlin New Testament scholar, when he carried off thirteen Greek manuscripts – two thirds of the mss on offer – including a ms of St Basil’s Homilies completed at Constantinople on Monday, 16 July in the year 899, one of the oldest dated Greek minuscule mss to survive. And in 1779, in Leyden, at one of the last big auctions at which he made his mark, Hunter spent around £110 on thirty-seven mss and sixty-eight printed books from the library of Pieter Burmann, who, with his father, had been responsible for the production of bulky ‘variorum editiones’ of the classics in eighteenth-century Holland. Not surprisingly in the library of a physician, Hunter possessed five codices containing works by the founders of medical science, Hippocrates and Galen. One of these, purchased at the Burmann sale has the distinction of being (aside from a fragmentary palimpsest in the National Library of Scotland), the earliest Western codex in Scotland. Written in a pre-Carolingian script, it was produced in northern Italy or southern France, and includes Galen’s treatise on acute ailments, on the examination of urines, and Hippocrates’ Epistle. Hunter also possessed two illustrated copies of the celebrated surgical treatise of the fourteenth-century Royal physician, John Arderne. His Speculum Phlebotomiae or Mirror of Phlebotomy includes the best examples of medical illustrations of the period. One copy, dating from the second quarter of the fifteenth century, shows a wonderful Zodiac man, intended to indicate to surgeons which parts of the body were influenced by which astrological sign. Of the seven twelfth-century English codices owned by Hunter, including works by Bede, a large and majestic Josephus, and the De Consolatione Philosophiae of Boethius, the foremost is undoubtedly the celebrated Hunterian (formerly York) Psalter. Left:The Hunterian Psalter, one of the treasures of Glasgow University Library, contains thirteen full-page illuminations. Pictured is the assumption of the Virgin Mary. Although now justly regarded as the greatest treasure of the library, it was acquired at the Louis-Jean Gaignat sale of 10 April 1769 by Dessain, Hunter’s agent, for fifty livres and one sou, a fraction of the sum paid there for some fifteenth-century printed books. Described in the sale catalogue as ‘codex pervetustus’, it was probably considered more of a quaint curiosity than the wonderful monument of Romanesque book art that it is now recognised to be. The vellum volume of some 200 leaves contains the normal Gallican text of the Vulgate, the Biblical Canticles, Litanies and other prayers, written in an English proto-gothic book hand. In conjunction with palaeographical evidence, the fact that there is no mention of the feast of Thomas of Canterbury in the Calendar (d. 1170, cd. 1173) suggests that it was made sometime between 1150 and 1170. In common with a small group of extant twelfth-century English Psalters – Copenhagen, St Albans, Winchester and Bury – the text of our manuscript is preceded by a sequence of richly executed illuminations. The scriptorium responsible for its production is still the subject of scholarly debate, although a localisation in southeast England seems probable. On opening the volume we first encounter the calendar:Each month has a finely historiated Kl for Kalendae at the beginning, and a roundel containing the appropriate zodiac sign for the month lower down the page. There follow thirteen full-page illuminations, showing scenes such as the creation of Adam and the temptation in the garden, and the bodily assumption of the Virgin Mary, borne aloft by fourteen angels. This image of the Virgin, completely shrouded, is wholly unparalleled in any other iconographical source. The most frequently reproduced illumination from the Psalter is a full-page author portrait of King David tuning his harp. Other instruments depicted are a giant two man organistrum or hurdy-gurdy, fiddles, possibly bagpipes, and a psalterium. The Gaignat sale was also the source of several other manuscript treasures. Lot 2886, the third decade of Livy’s History, treating the Second Carthaginian War, is undoubtedly the most impressive of all the classical mss in the collection. This magnificent manuscript has been illuminated by the Master of the Vitae Imperatorum. Taking his name from a copy of an Italian translation of Suetonius’s Lives of the Twelve Emperors, illustrated for Filippo Maria Visconti, this accomplished miniaturist at the court of Milan has provided each of the ten Books with a wonderfully executed historiated initial letter, encapsulating the main action of that section. Within the small frame of the capitals, the illuminator has depicted a masterly range of action and emotion. For instance, the initial letter for Book 21 shows Hannibal crossing the Alps in the upper section, and below, the defeat of the Romans on the banks of the Ticinus. The Gaignat sale also provided Hunter with a number of important fifteenth-century French manuscripts. One of these is the Cent Nouvelles Nouvelles, the uniquely surviving manuscript of one hundred, often scatological tales, modelled on Boccaccio’s Decameron. The tales, supposedly told by members of the Burgundian court, was probably presented to Philip, Duke of Burgundy in 1462. It dates from around twenty years later and is replete with scenes of intimate and domestic life, sometimes sexually explicit. Hunter also owned some fifty-three Middle English manuscripts, fifteen deriving from the library of the Suffolk collector ‘Honest Tom’ Martin of Palgrave (1697 – 1771). From Martin he acquired several item of primary significance, amongst them another uniquely surviving manuscript text – that of Chaucer’s Romaunt of the Rose. Dating from the mid-fifteenth century, this codex was subsequently used by William Thynne as the copy text for his edition of Chaucer’s Works, London, 1532. Hunter died on 30 March 1783 with, as one contemporary commentator put it, ‘all his fortune… locked up in his grand museum’. He had no creditors, no needy dependants. His brother John failed to have his will annulled, and so Hunter’s library returned to the country of his birth, where it is preserved intact at the University of Glasgow Library, for the benefit of all, and the continuing improvement of knowledge.